Queen nakeuh saboh kawan (grup) meusep aleran nu metal ngön rock alternative nyang meuasai di nanggroe Inggréh. 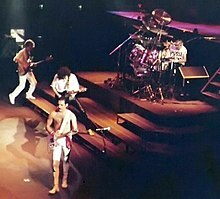 Queen ka lheueh jipeuteubiet 15 boh album studio, nyakni Queen, Queen II, Sheer Heart Attack, A Night at the Opera, A Day at the Races, News of the World, Jazz, The Game, Flash Gordon, Hot Space, The Works, A Kind of Magic, The Miracle, Innuendo ngon Made in Heaven. Queen meujaya nibak jipeuturi lagu-lagu lagee Bohemian Rhapsody, The Show Must Go On, We Will Rock You, We Are the Champions, ngon Another One Bites the Dust. Meunyo totaljih, album-album Queen ka lheueh geupubloe trok 'an 300 juta krek.